It is 10:35PM, which means it’s well past my bedtime. I should’ve been tucked in awhile ago but I have yet to shower, need to finish work that’s due in the morning (haven’t started) and my unfolded laundry has been staring at me in judgement for an hour now. At least it’s clean. Small win. Needless to say, I’ve been busy. Don’t worry! I’m doing fine, but I wanted to step back from the busy state that is my life and just start writing. I wrote in my journal a couple hours ago and I went on for pages and pages – had a lot more to say than I thought. As a writer, I feel my emotions build up and I get anxiety if I can’t creatively express myself so, I wrote personally for myself and now I am writing for you, because I miss you. Time check: 10:49PM. I’m giving myself 5 more minutes then I need to at least fold a t-shirt to make myself feel better knowing I have started to put my laundry away. 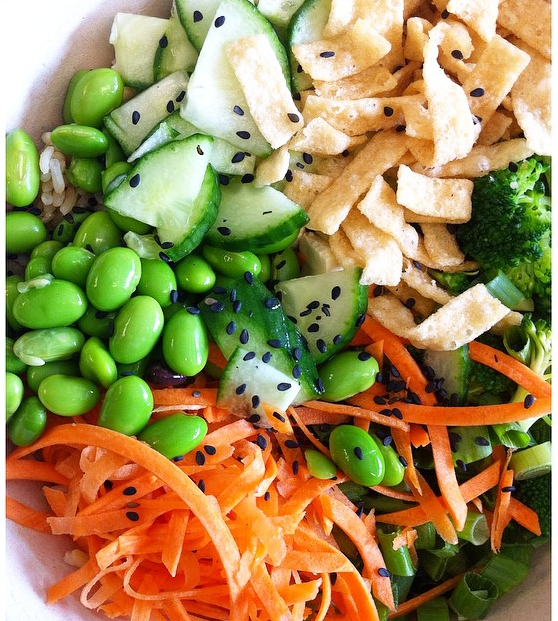 Side note, have you ever been to Freshii? There is one across my work and whenever I forget to pack a lunch, my go-to is their Teriyaki Twist (thank you to my co-worker Daliah for introducing). It contains brown rice, broccoli, carrots, edamame, cucumber, green onions, sesame seeds, crispy wontons, teriyaki sauce and I usually get it with tofu or falafel. SO. GOOD. I’ll eat this around 1:30PM and I’m not hungry again until 7:30PM, which makes it ideal for the days I have soccer right after work. Delicious, healthy and filling. Win-win-win. Time is up, I wish I could write you a novel but reality is calling me back. On Canada Day (this Wednesday) I am having a crazy, insane adventure on a yacht so, I’ll be sure to vlog and share some good ol’ fun times with you. Can’t wait!